An Old American Health Insurance Company review leads to Old American Insurance Company. This company used to sell personal health insurance but in recent years changed direction and switch to exclusively selling life insurance policies. This change was because life insurance seemed to be in higher demand in the market in which they were working. If you are looking for personal health insurance, you can enter your zip code in the free box now to receive quotes on health insurance from several top companies. 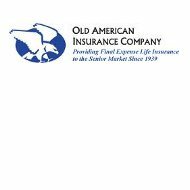 Established in 1939, Old American still has the same vision and trustworthy practices as they did when they sold health insurance. They continue to be committed to customers and helping them to get the coverage they need for both peace of mind and to provide their families with the proper protection. Agents are trained to match the right policy with the right individual. Life insurance is a very personal type of insurance. People often have different ideas about how they want to leave behind their finances, who they want to benefit, and how much coverage is necessary. Because of this, Old American has a variety of comparative life insurance products. These choices include both whole life final expense and term life insurance. The first type of final expenses insurance offered is Immediate Death Benefit. This coverage is a final expenses product, and it is customized according to your financial situation, your health, and your age. Policyholders have the option to pay premiums over the life of the policy or pay higher premiums for 10-20 years paying off the policy early. The second type of final expenses coverage is the Two-Year Modified Graded Death Benefit. This policy is for individuals ages 40-80 who have health problems. The first two years of the policy have modified benefits and then the plan evens out. The third type of final expenses policy is the Increasing Benefit Series. The payout dollar amount for this type of policy increases by 5% every year. Old American Insurance Company offers one type of term life insurance policy. Term life insurance is a policy that you purchase for a pre-determined amount of time and when the term is up, you can forego the policy or renew it. It is ideal for individuals who are ages 20-65 and in good health. Terms for the policy include 10 years, 15 years, and 20 years. Term life insurance is the oldest type of life insurance and used to be the only type available. It is the most cost effective as well. Term life insurance rates are often less than $100 per month and sometimes even less than $50 a month. If the insured dies during the term, the entire premium amount is paid out to the beneficiaries immediately as long as the death was not caused by an exclusion such as suicide. The debate continues as whether term life insurance or whole life insurance is the better option. The answer really depends on what you are looking for in a life insurance policy. Term life insurance policies cannot be used for anything other than life insurance, but whole life insurance policies can be drawn from, with penalty, as needed. They serve as a life insurance policy and an investment tool as well. Old American Insurance Company has one juvenile life insurance product available. It is the Peace of Mind for Tomorrow life insurance policy. It is available for parents or grandparents to purchase for children ages 2 weeks to 15 years of age. The age cuts off at 15 because the opportunity to drive is at about age 16 and the death risk for teenagers 16-19 increases by 10 fold. This life insurance policy provides a death benefit if the child dies by accident or a disease. If a child has already been diagnosed with a disease or condition, they cannot be approved for the Peace of Mind for Tomorrow policy. The child must have a clean bill of health signed off on by a pediatrician. This is why the period starts at 2 weeks since newborns have their first official check up by a pediatrician at this age.